While the rest of the hockey world focused on the Sochi Olympics earlier this year, a group of NHL players who weren’t after medals were instead at Fort Bragg, North Carolina, staying sharp with the help of a special guest from the Special Forces. Michael Cathcart, who went by “Sgt. Mike” with his training partners from the Carolina Hurricanes, skated alongside the pros for 45 minutes at Cleland Ice Rink in February, led them in a team stretch, even notched a goal and an assist during the practice, according to a write-up on the team’s official website. “It was great that the ‘Canes let him come out there and really live a dream,” then-battalion commander Lt. Col. Brad Moses said at the time. 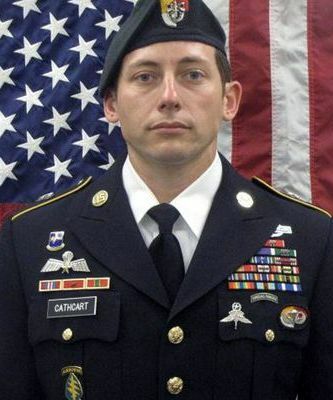 So when word broke that, Cathcart, a sergeant first class with 3rd Battalion, 3rd Special Forces Group, died Friday during combat operations in Afghanistan, the team joined Cathcart’s extended Army family in honoring his memory. A Michigan native, Cathcart spoke glowingly about his NHL experience in a post-practice interview with the team’s website. Cathcart singled out the chance to meet former NHL great Rod Brind’Amour and to work out with the Staal brothers as event highlights. The visit made an impact in both directions; the team’s tribute video (posted above) features many players offering their condolences and sharing their memories. The team’s visit, which included a youth hockey clinic, was part of an effort involving two charity groups: the Special Forces Charitable Trust and Defending the Blue Line, which gives children of military members the chance to play ice hockey. For links and donation information, click here.